1. On August 21, India will host the heads of 14 island nations at the Forum for India-Pacific Islands Cooperation (FIPIC), in what is seen as a first step towards greater engagement with the region, which is important from an economic and geostrategic standpoint. The upcoming summit in Jaipur is expected to pave the way for agreements in agriculture, food processing, fisheries, solar energy, e-networks for coordination in telemedicine and tele-education, space cooperation and climate change. 2. Ved Prakash Mahawar took over as Director (Onshore) of state-owned Oil and Natural Gas Corp (ONGC). As Director (Onshore), a board level position, he will be directly looking after all the onshore operations spread across the country which significantly contribute towards ONGC's overall physical performance. He replaces Ashok Verma, who superannuated. 3. The executive board of the International Monetary Fund (IMF) has approved the disbursement of about USD 1.7 billion to Ukraine. The IMF has pledged USD 17.5 billion in total financial assistance over four years. Thus, the total amount of financing of Ukraine from the Fund will reach 6.68 billion. This financing is aimed at restoring the country's economy, empowering public finance system and maintaining financial stability. 4. Indian women's recurve team of Deepika Kumari, Laxmirani Majhi and Rimil Buriuly won a silver medal at the World Archery Championships in Copenhagen, Denmark. In the Summit clash, the Indian trio lost the World Championship final to top seeded Russians 4-5. The Russian team that defeated the Indian trio was comprised of Inna Stepanova, Ksenia Perova and Tuyana Dashidorzhieva. It is India's second silver in the ongoing World Archery Championships where compound archer Rajat Chauhan opened the account with a historic individual medal. 5. CERN announced to formally confer its associate membership to Pakistan. With this Pakistan received a huge boost for its nuclear programme. Pakistan thus became the first member of CERN among Asian countries and the first non-European member of this prestigious organization. The associate membership will open a new era of cooperation that will strengthen the long-term partnership between CERN and the Pakistani scientific community. 6. South Sudan became the latest and the 206th member of the International Olympic Committee (IOC) at committee’s ongoing annual meet at Kuala Lumpur (Malaysia). The significance of its inclusion is that this was done despite the ongoing fighting in the South Sudan. With the country now officially part of the IOC, it can send a team to next year’s Rio Summer Olympics who can compete under its own flag. 7. Kochi (Kerala) naval harbour of Indian Navy became the first in the country to get the Integrated Underwater Harbour Defence and Surveillance System (IUHDSS), an automated system capable of detecting, identifying, tracking and generating warning for surface and underwater threats. IUHDSS is a state-of-the-art naval defence system which will enable operators to foresee, and respond to, surface and sub-surface threats to vital assets along the harbour and warships in the quay. It was designed by Israeli Aerospace Industries (IAI). 8. According to data released from the 68th round of the National Sample Survey (NSS) on fuel used for cooking and lighting, the percentage of rural population in the country still used firewood for cooking in 2011-12 was 67.3%. The data relate to a survey conducted by the NSSO on a nationally representative sample during 2011-12. According to the survey Tamil Nadu had the highest use of LPG among rural households during 2011-12. 9. Golfer Ranveer Singh Saini created history by becoming the first Indian to win a Gold medal at the Special Olympics World Games. The 14-year-old autistic golfer achieved the feat in GF Golf-Level 2 Alternate Shot Team Play event. Ranveer and his partner Monica Jajoo were nine shots clear of joint second-placed teams from Hong Kong (Tsz Leung Chung-Ka Kit Lam) and Nippon (Takefumi Hiyoshi-Tadatoshi Sakai). 10. 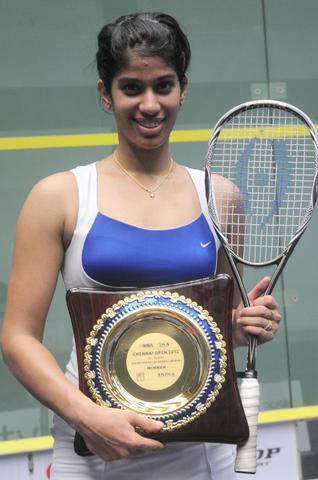 Indian squash champion Joshna Chinappa won the women’s squash title in the 15000 US Dollar Victorian Open WSA Event in Melbourne, Australia. In the final clash, Chinappa defeated second seeded Line Hansen of Denmark 11-5, 11-4, 11-9. This was tenth WSA title for 28-year-old Joshna, the last being the Richmond Open title win in April 2014. 11. Ganga Ram Agarwal, an officer of the Indian railway services of electrical engineering (IRSEE), has been posted as the new secretary of the railway board. He takes over from P.C. Gajbhiye, who superannuated. Prior to this, Agarwal was working as chief electrical engineer, central railway.